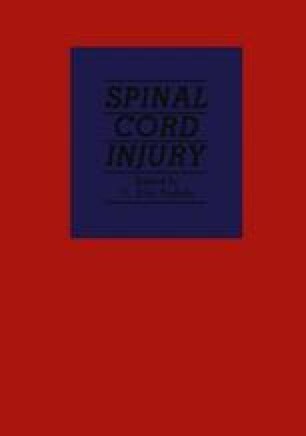 During the chronic phase of spinal cord injury, serum dopamine-β-hydroxylase activity, arterial blood pressure, and blood flow in the fourth finger, the ballux, and the calf were measured in nine quadriplegic subjects before, during, and after expansion of the urinary bladder. In addition, in five chronic quadriplegic subjects, serum dopamine-β-hydroxylase activity, urinary catecholamine metabolites, and arterial blood pressure were measured before and during spontaneous hypertensive episodes. There was a significant correlation between the different stages of hypertension, the serum dopamine-β-hydroxylase activity, and the concentration of urinary catecholamine metabolites. The highest levels were found at the height of intracystic pressure when the arterial blood pressure was at its maximum but the pulse rate had dropped to its lowest level. At the same time the blood flow in the upper and lower extremities and the calf musculature was below detection limits, and peripheral vascular resistance was markedly enhanced. Serum dopamine-β-hydroxylase and arterial blood pressure levels correlated directly with urinary concentrations of normetanephrine but not with those of metanephrine. The data provide evidence for an in vivo simultaneous, proportional release of dopamine-β-hydroxylase and norepinephrine, suggesting release by exocytosis. The data further show that dopamine can also be released together with norepinephrine and dopamine-β-hydroxylase as evidenced by increased urinary concentrations of its major catabolite, homovanillic acid, during hypertensive stress. The hypertensive response in quadriplegic subjects during routine test of bladder function renders these subjects ideal models for self-controlled studies of neurogenic hypertension and its biochemical parameters. The results indicate that hypertension in quadriplegia, whether spontaneous or induced, is caused by increased release of norepinephrine and that the half-life of dopamine-β-hydroxylase released during stress is shorter than that previously reported. This paper is reprinted by permission of the American Heart Association from Circulation Research 35: 850–861, Dec. 1974.